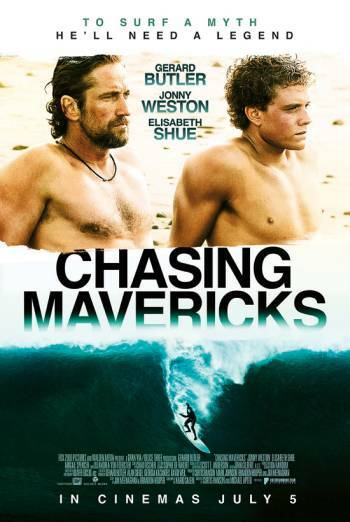 CHASING MAVERICKS is a US drama about a teenage boy who is trained by an experienced older surfer to surf some powerful waves. The film contains a scene in which a woman dies following a stroke. She is seen lying motionless on the floor and in her husband's arms as her distressed young daughter watches. There is also a scene in which a surfer is knocked off his board and dragged beneath the surface by a giant wave. He does not reappear for some time and it is initially believed that he may have died. In one scene a man tells a young surfer "I'm sure that scared the living piss out of you" after the surfer has seen a shark. The film also contains some brief scenes in which people scuffle with each other, a scene in which a woman screams as she cowers on the floor as a man aggressively stands over her, and a scene in which a young boy is briefly dragged underwater by a giant wave before reappearing safe and unharmed.